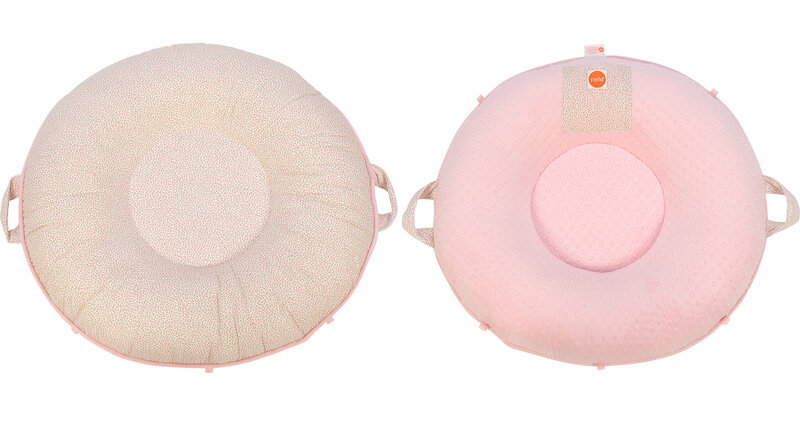 The Everly's Bouquet pink Pello Luxe Floor Pillow with pink back will stay with your child for many years (age limit is 8 years). The soft center cuddles your baby and is perfect for practicing sitting, tummy time, and other supervised playtimes. Older children love lounging in it and using it as a reading and TV pillow. Two sturdy padded handles offer easy portability. The fabrics are made from 100% cotton and luxe brushed poly; the filler is made from hypo-allergenic and flame retardant polyester, making this floor pillow kid friendly and completely washable. A 6.5 inch square peek-a-boo pocket is designed to carry your child's favorite toys. This floor pillow with a 34" diameter is comfy and functional for children up to 8 years old.